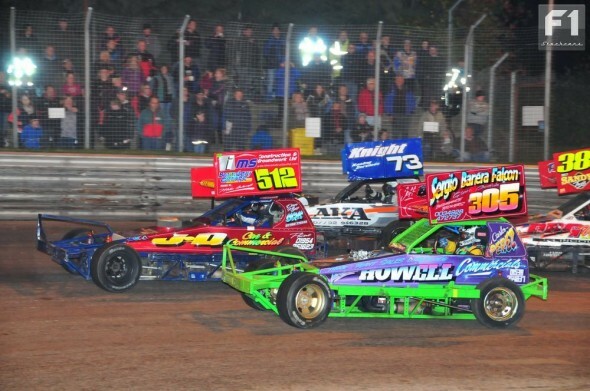 The last tarmac weekend of the season kicked off with Shoot Out Series Round 8 at Birmingham Wheels, sponsored by B E Allen & Sons. Twenty-one cars contested Heat One including Carlos Perez (305) in a brand new machine and F2 man Jack Aldridge in the former Mike James car, racing under number 421. The start was a bit dodgy with the reds in with the blues before the green flag was shown but it was non-star drivers who ran away with the race while the Shoot Out drivers (2, 4, 150, 212 & 259) delayed each other. 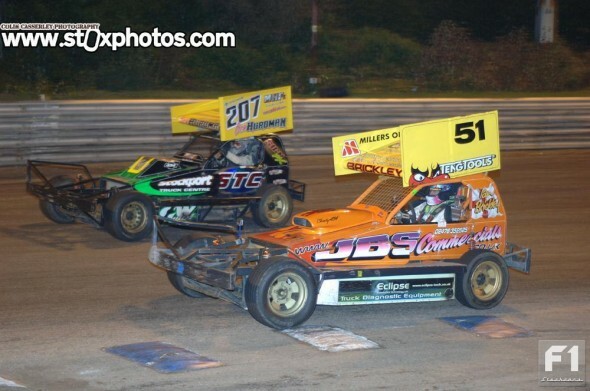 Bobby Griffin (166) took the lead from long time leader Wass (283) with 4 to go and drove away for the flag, with Wass second and Booth (446) third. 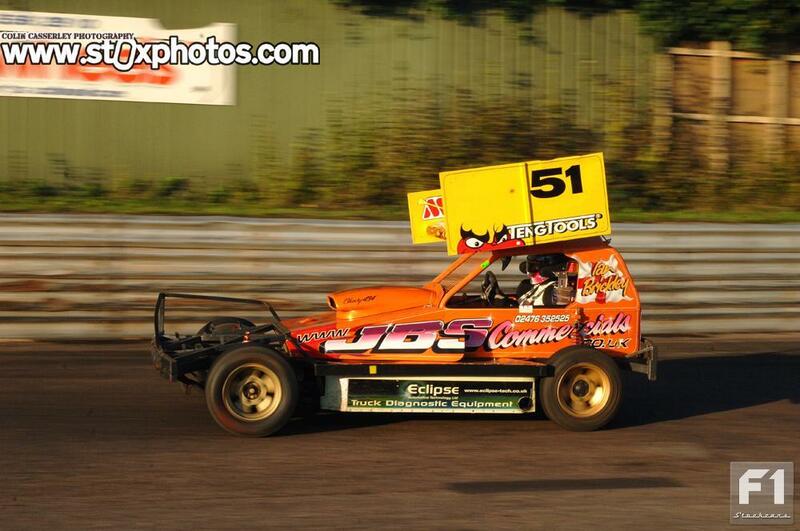 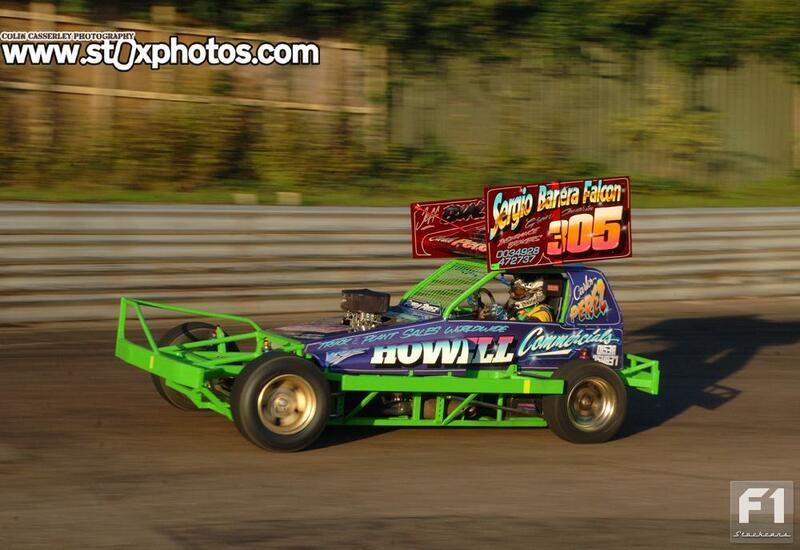 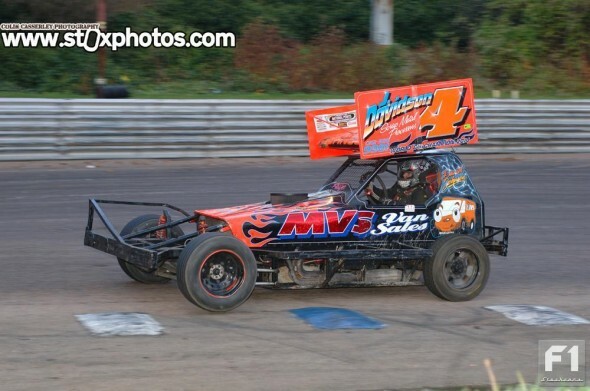 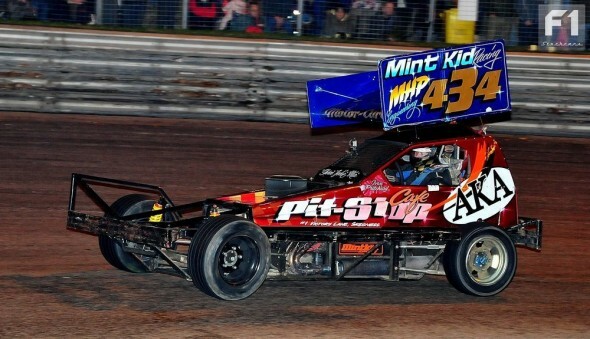 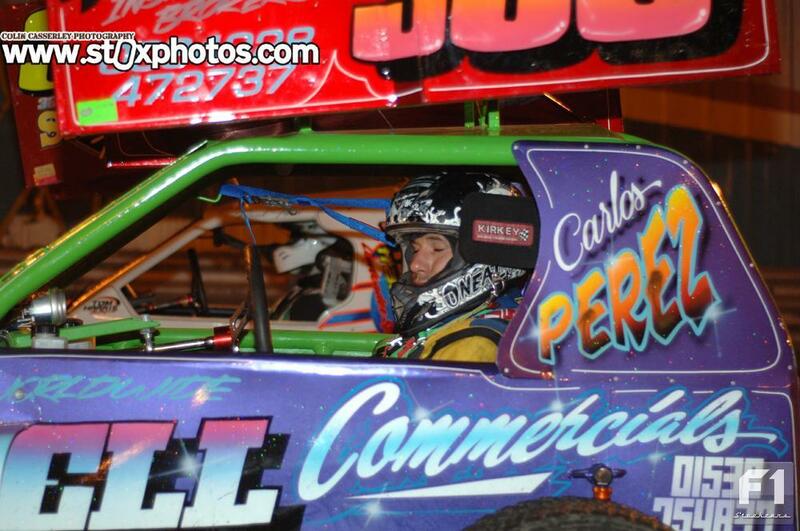 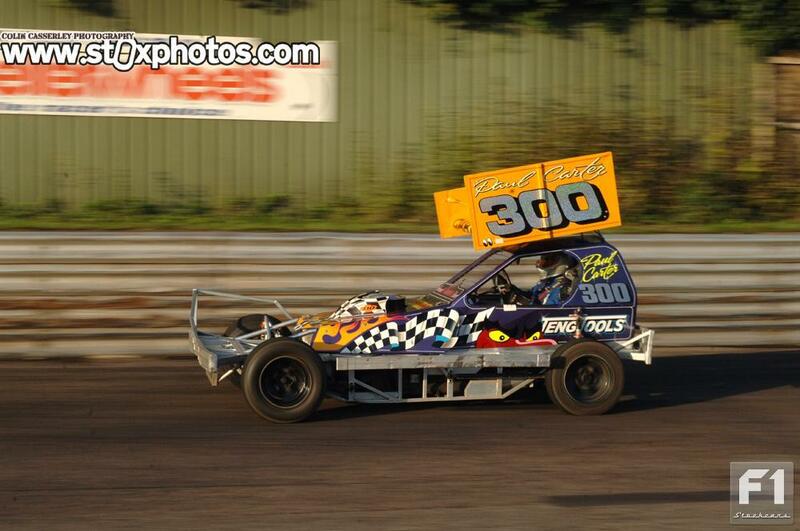 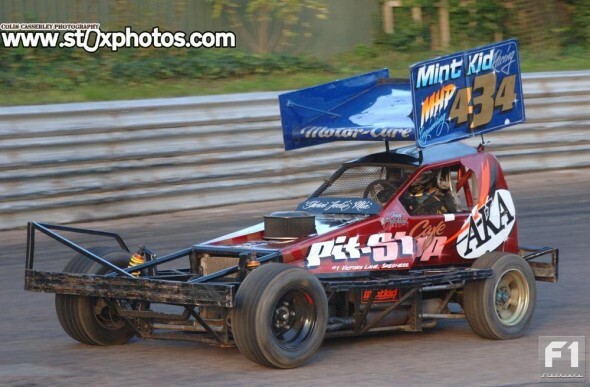 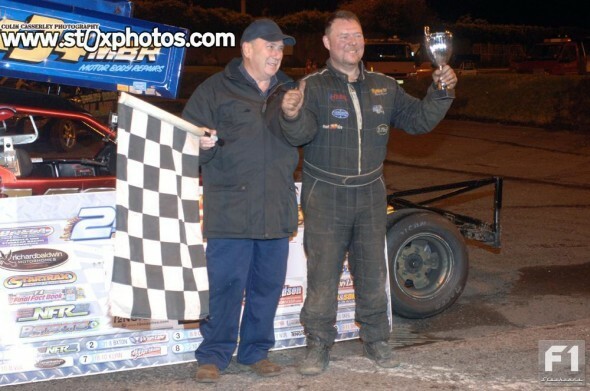 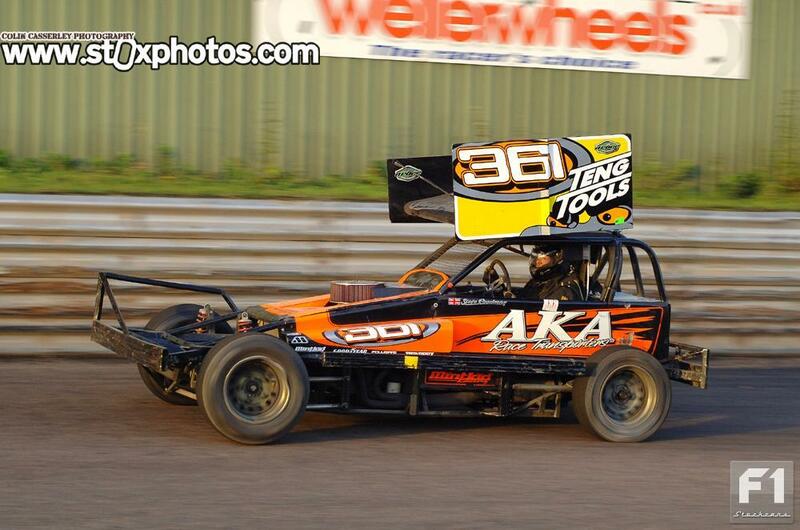 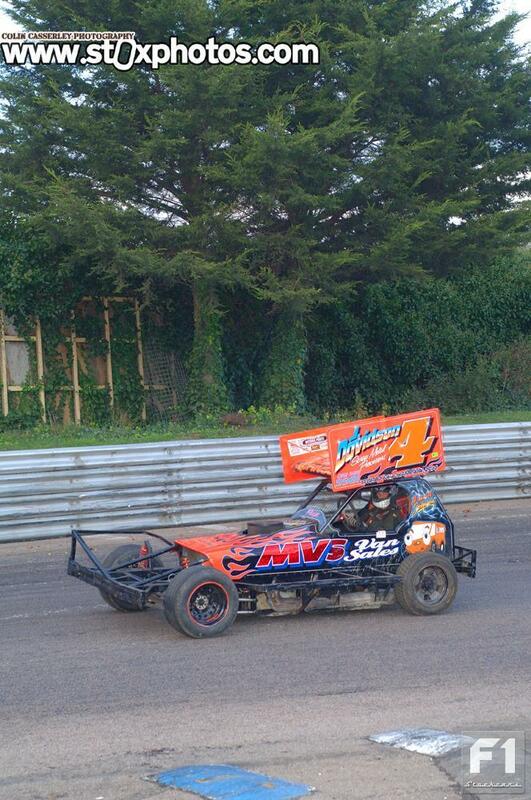 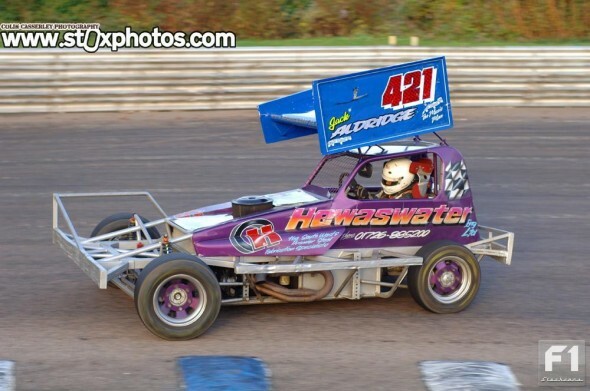 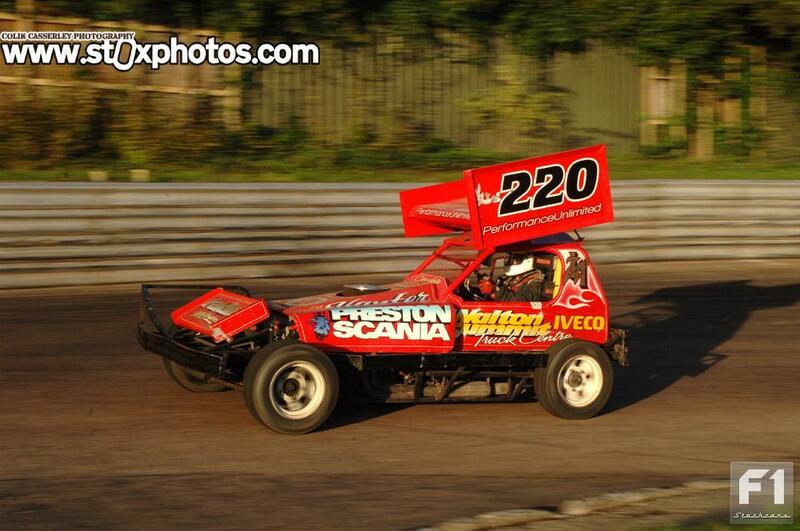 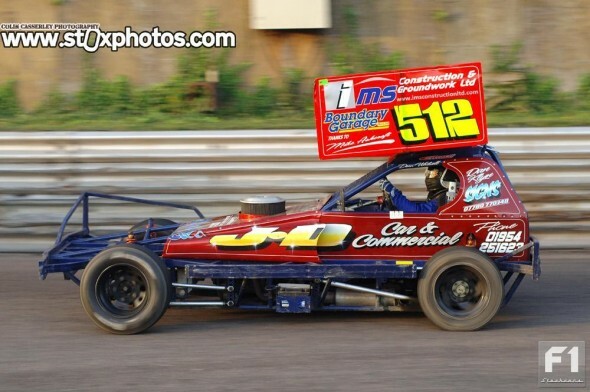 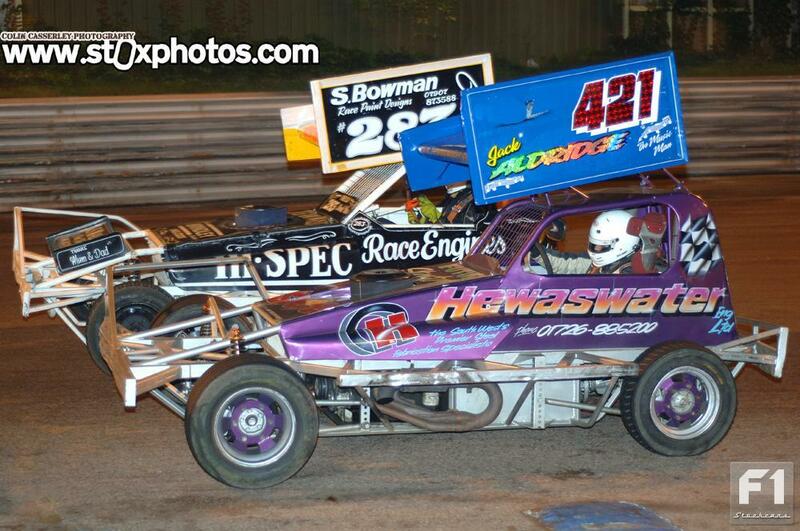 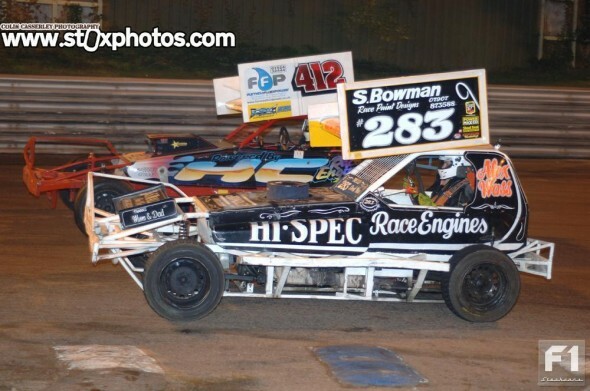 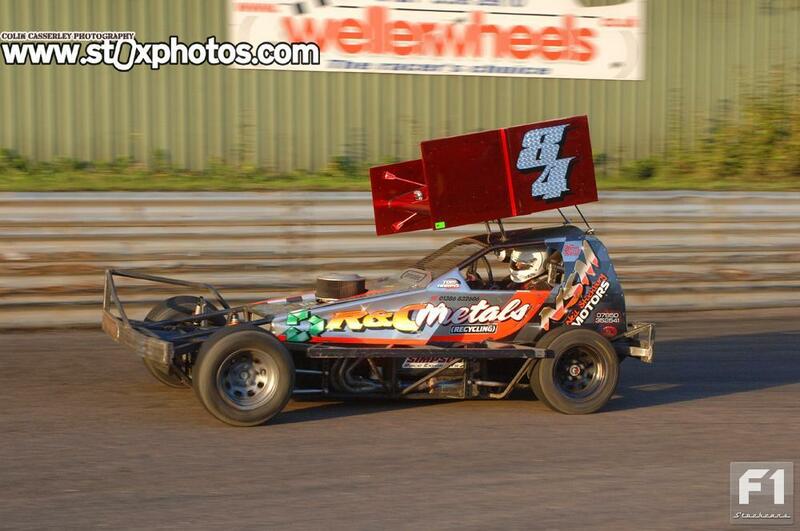 Danny Wainman led the Shoot Out contenders home in fourth. Bobby Griffin (166) makes his move to the front, passing the impressive long time leader, Alex Wass. Bobby won Alex was second. 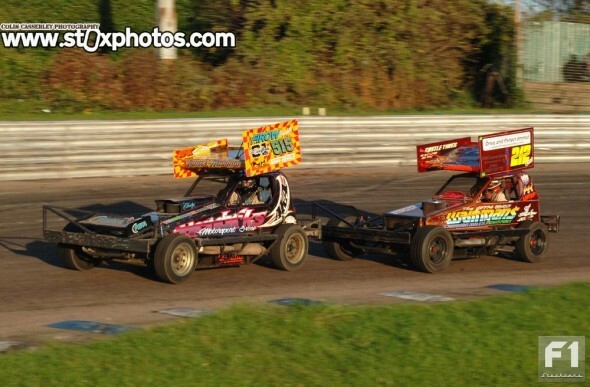 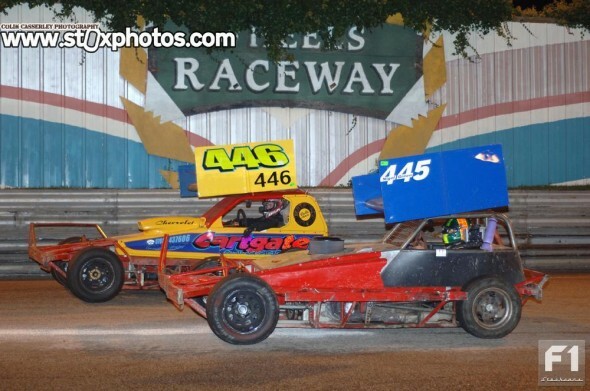 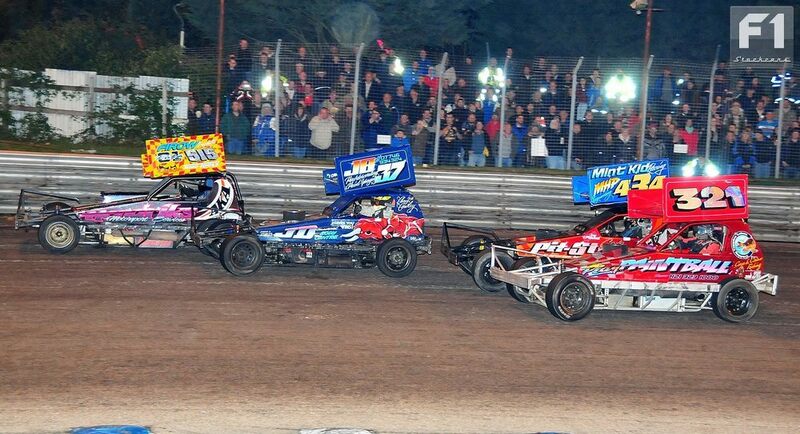 Heat Two was a more lively affair, with 16, 84, 55, 318 and 515 looking to improve their points totals, but again it was lower grade drivers who benefitted in the long term. 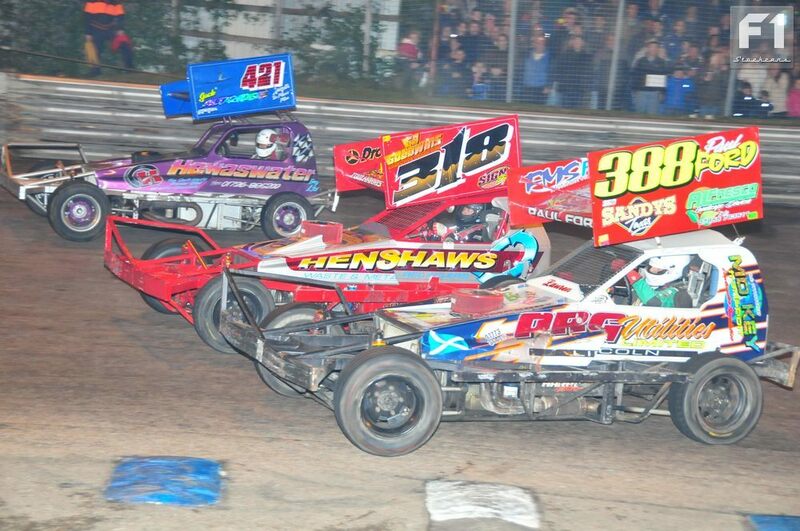 Dylan Williams-Maynard (51) in the ex-Brickley (246) car held sway as Harris and Speak traded paint while Newson and Junior Wainman saw their Championship chances take a nosedive when they tangled on the second bend. The 51 car crossed the line first ahead of Paul Carter (300) and Carl Pickering (141). Paul Ford brought the red topped 388 car home in fourth with Harris in fifth. Speak and Finnikin battled to the end but were only disputing ninth and tenth places. Heat 2: Rob Speak and Tom Harris trade places , Tom came home 5th Rob was back in 9th spot at the end. Twenty three cars for the Consolation led by car 325 as Reedman (361) made friends with no one, bumpering cars aside and going a lap down for his troubles. 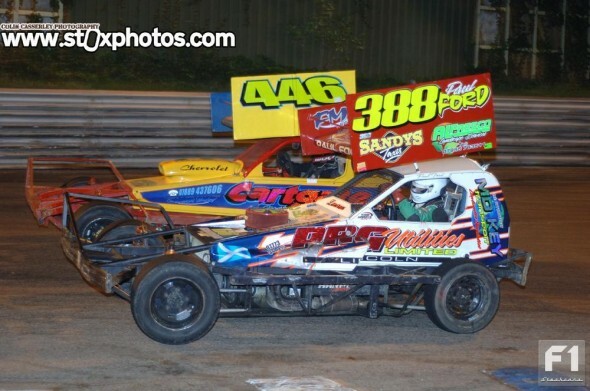 515 and 16 went off the back of the grid but struggled from the start, while a fast moving Chris Cowley (37) moved into third. 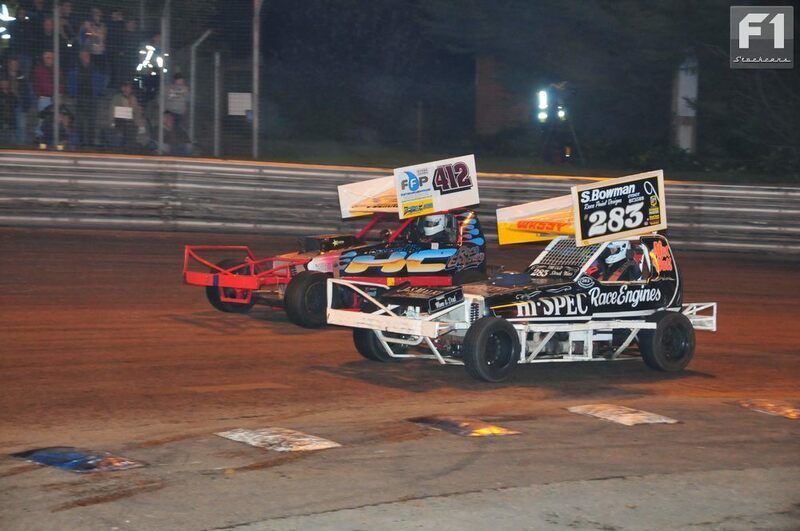 325 spun on the pit bend, handing the lead to Ben Hurdman (207) with Ivan Pritchard (434) into third spot behind Cowley. Following a caution for 287 & 172 stranded on the back straight, the green flag to restart the race was largely ignored by the front runners and in the ensuing chaos a lap down Reedman landed a big hit on Cowley. 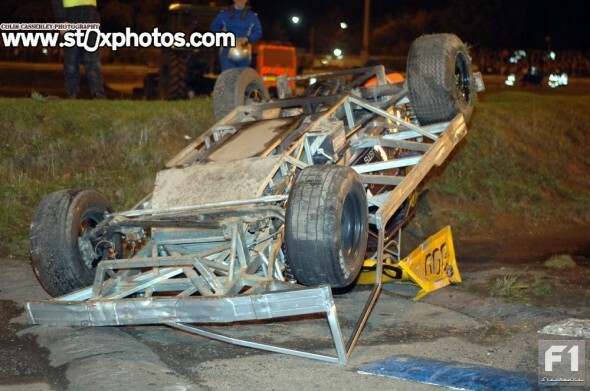 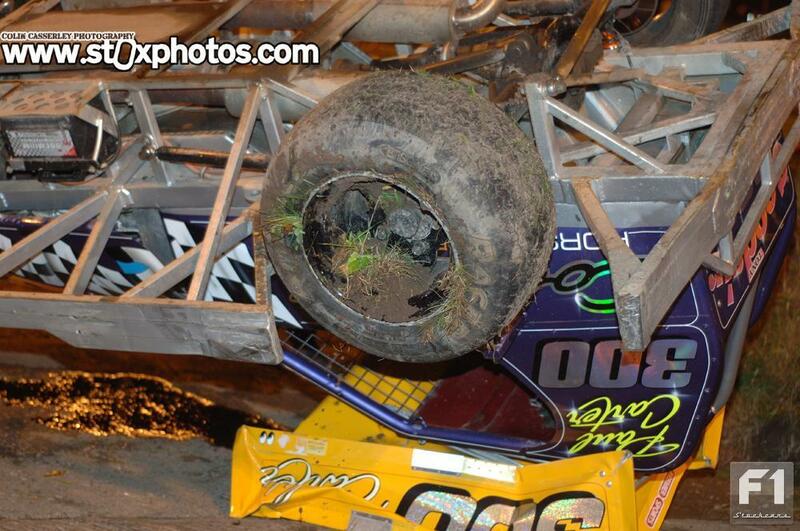 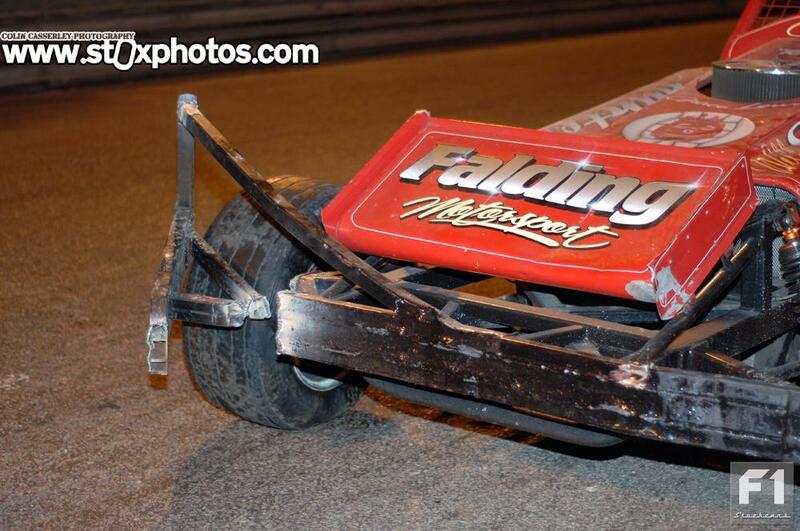 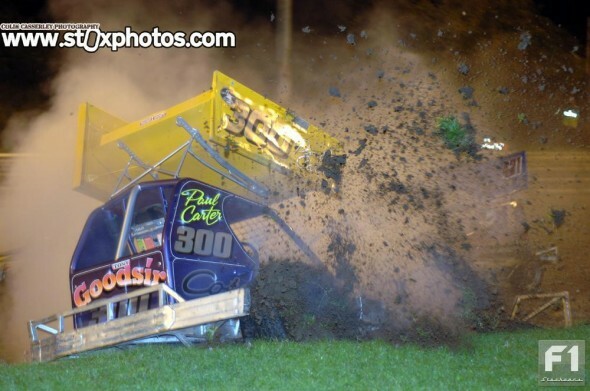 Cowley recovered, did the same to Newson, then disposed of Wainman into the first turn Armco, both drivers retiring with flat front tyres and badly bent front corners. 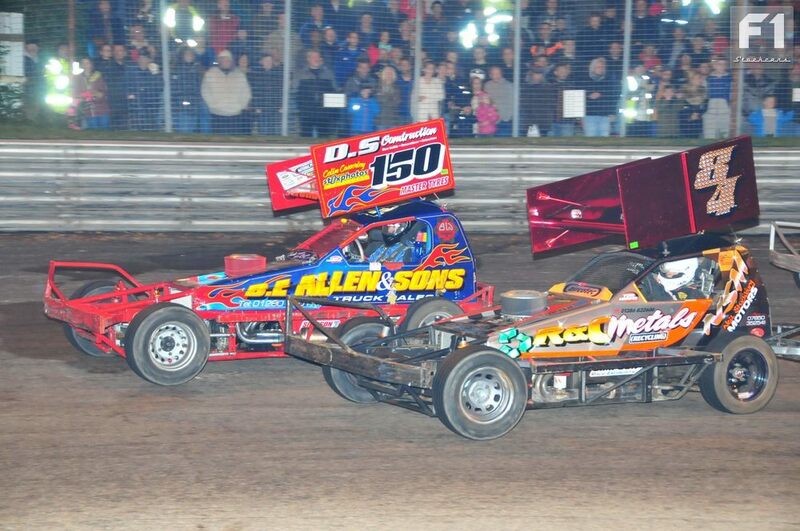 Pritchard held the lead to the flag with Newson coming trough to a creditable second place. 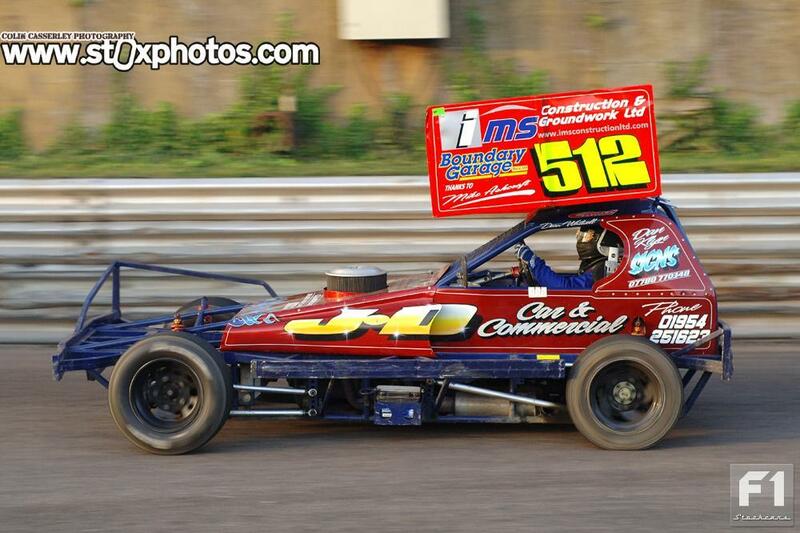 Ivan Pritchard (434) was the class of the field in the Consolation. 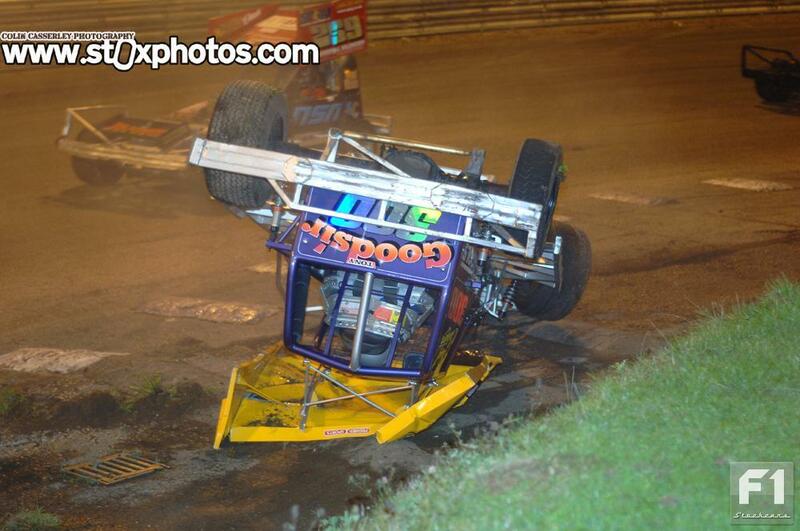 His night was to get even better later. 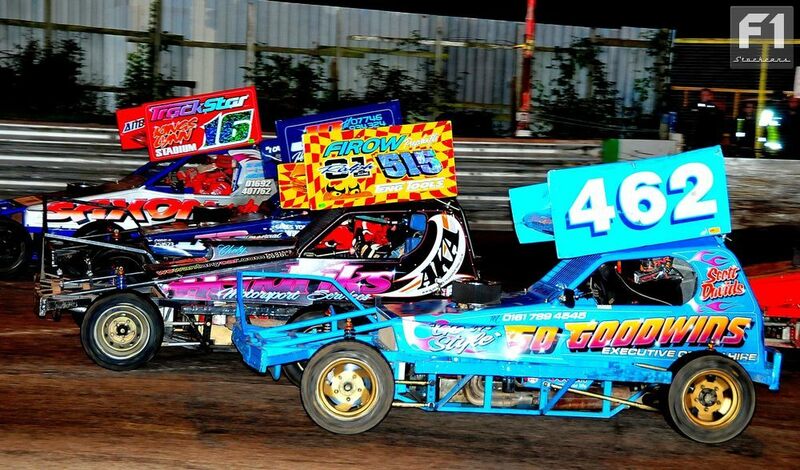 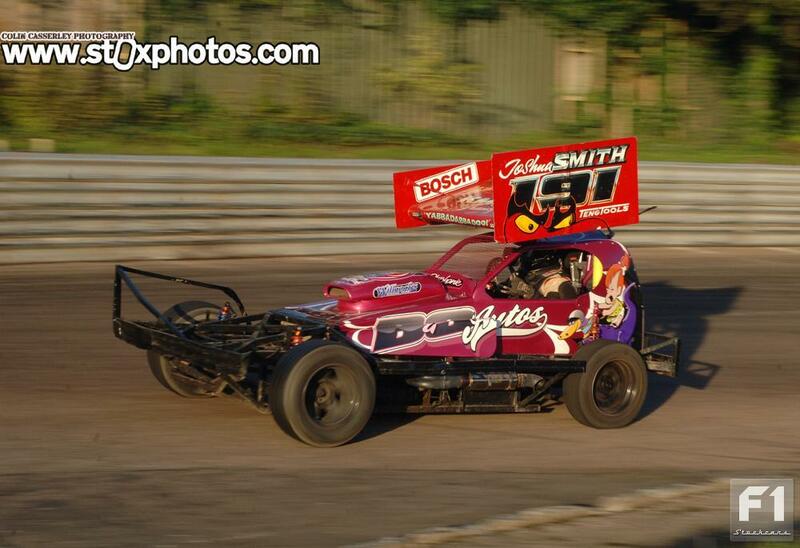 The Final began in spectacular style as the 51 and 166 tangled and charged the home straight earth banking. 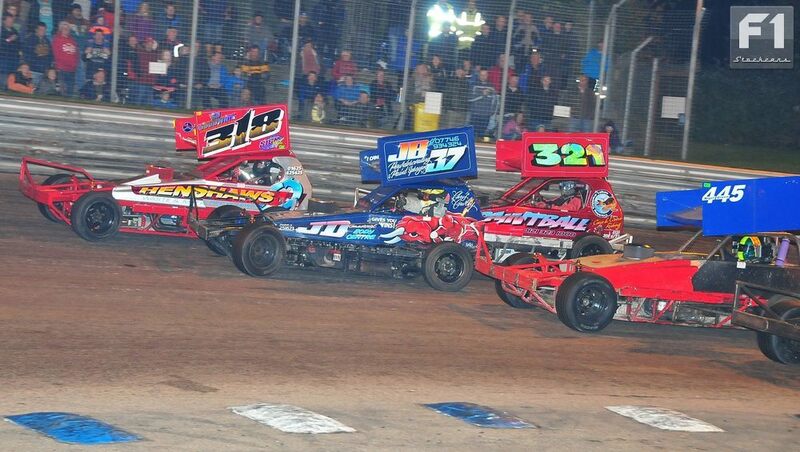 Johnson (4) and Finnikin (55) hit trouble early on as Paul Harrison made up ground as the first of the Shoot Out contenders. The caution came out for Paul Carter (300) who spun on the second bend, floored it, backed the car up the banking and promptly rolled over! 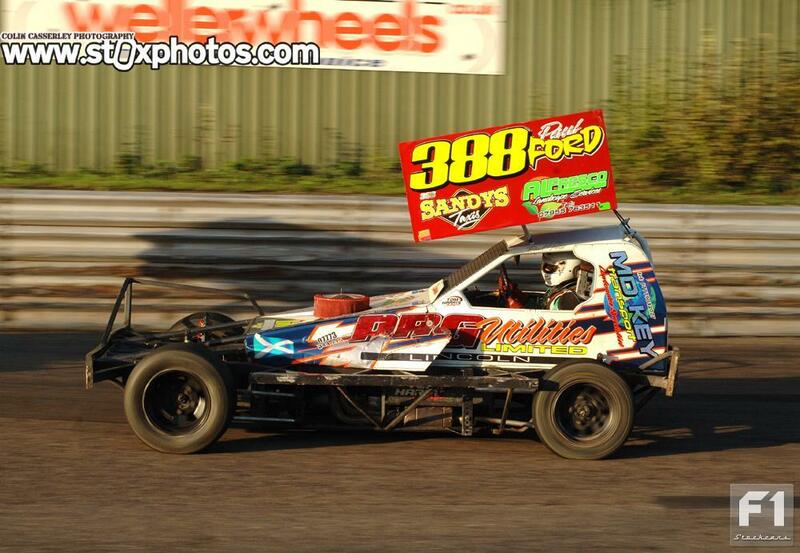 Chad Evans (392) led the restart from 141 and 434 with Paul Ford again well-placed. 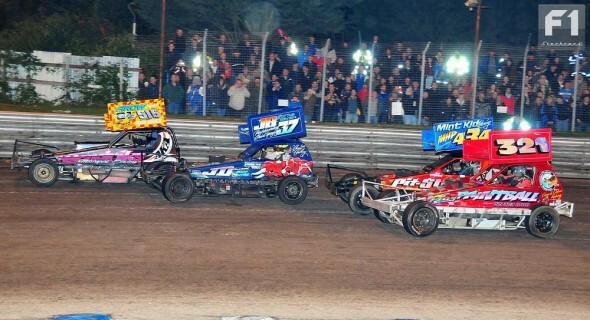 Harris battled Newson, ahead of 150 and 55 but up front Pritchard held sway, taking his second victory of the night ahead of Ford and Booth, with shoot out drivers filling fourth to seventh places, but Newson was not amongst them – he had been sent crashing heavily into the pit bend fence by a clinical, decisive Harris move from which there was no coming back. 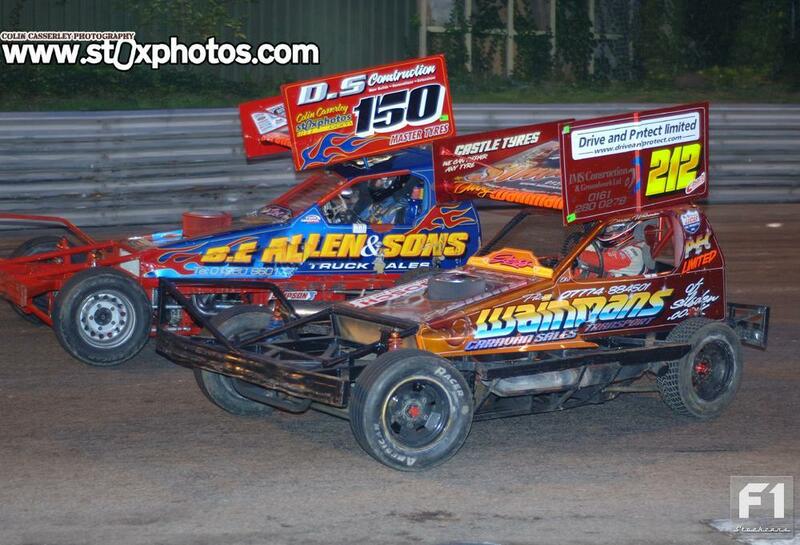 Tom Harris and Mick Sworder trade places. 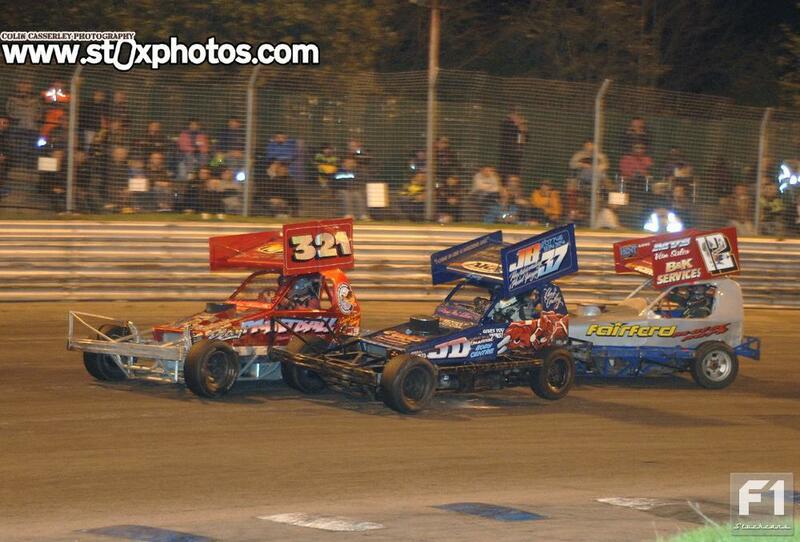 Tom finished in a lowly 6th and Mick DNF. The Grand National raised the biggest field of the night, 33 cars lining up including 8 Shoot Out hopefuls but surprisingly no Tom Harris. 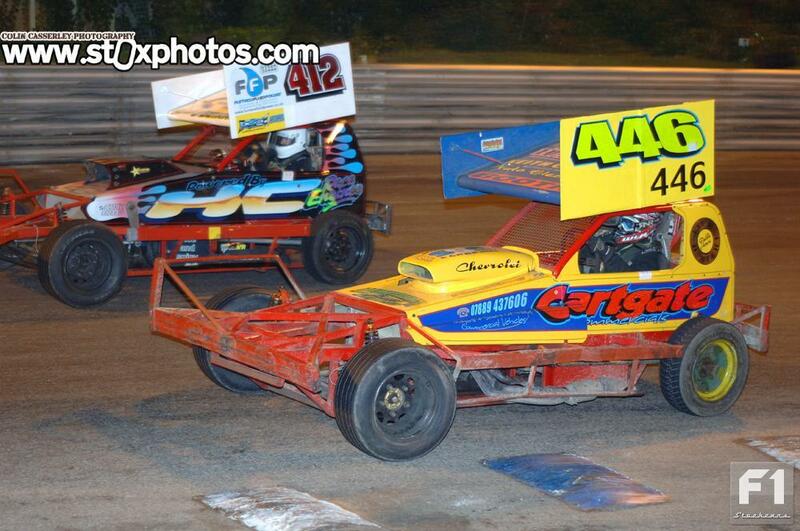 Johnson made a move on Sworder, Speak passed them both, as did FWJ while up front Gareth O’Bierne (412) held point. 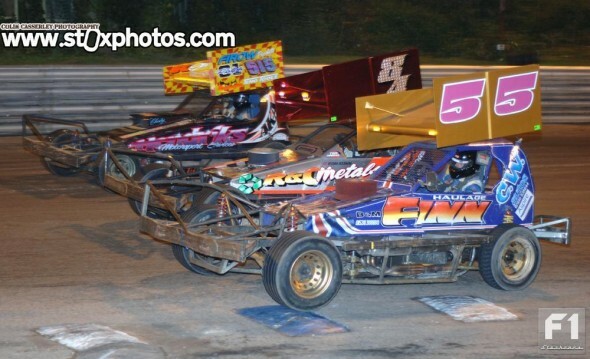 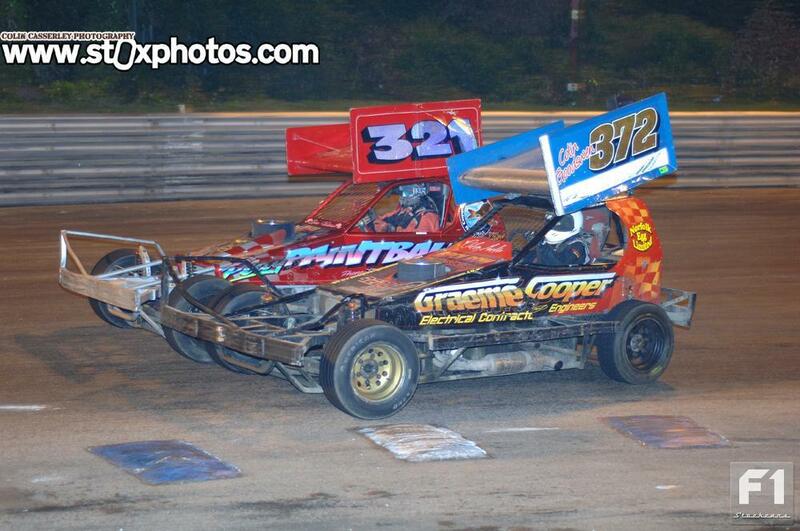 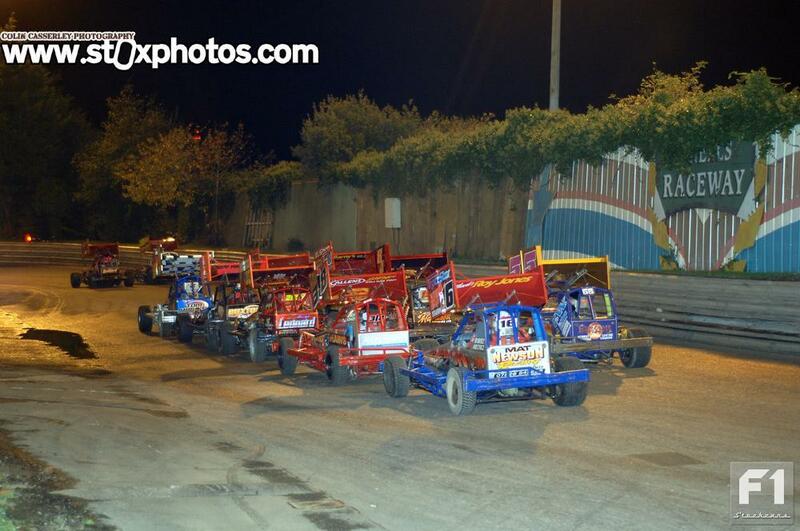 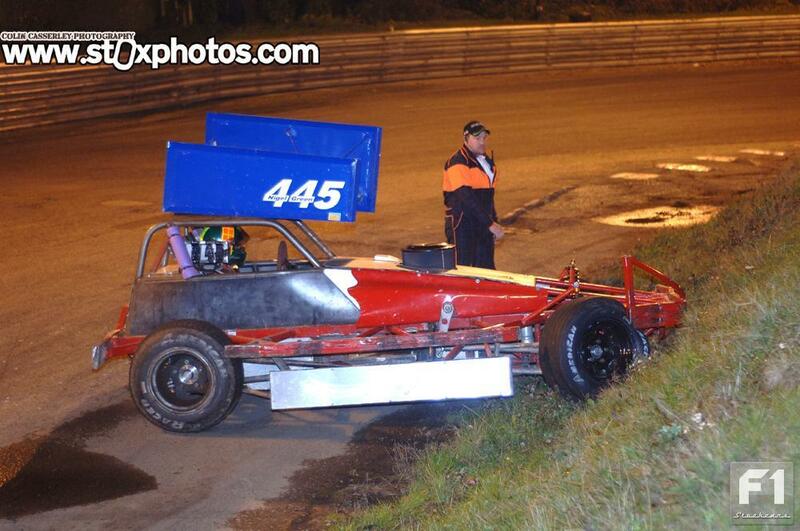 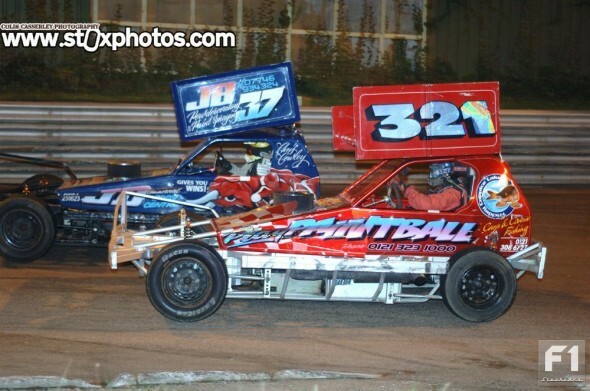 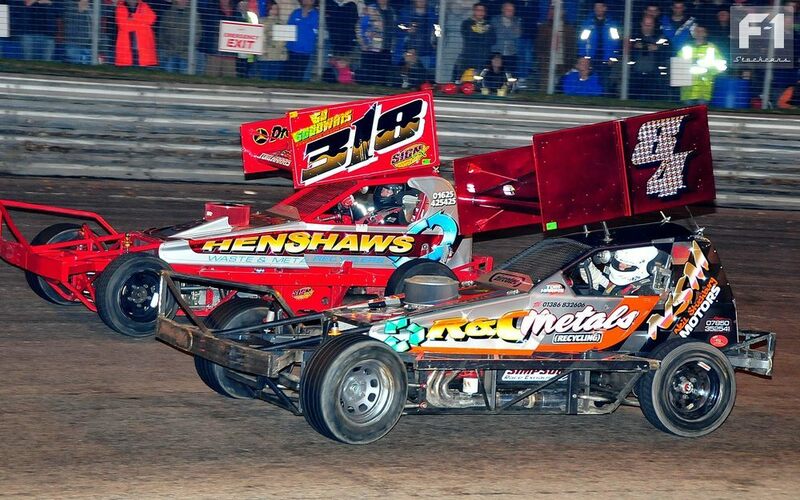 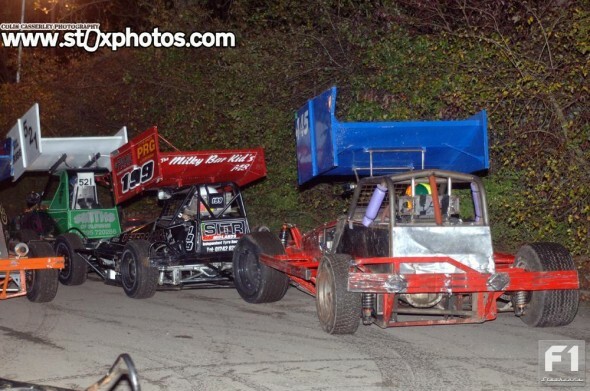 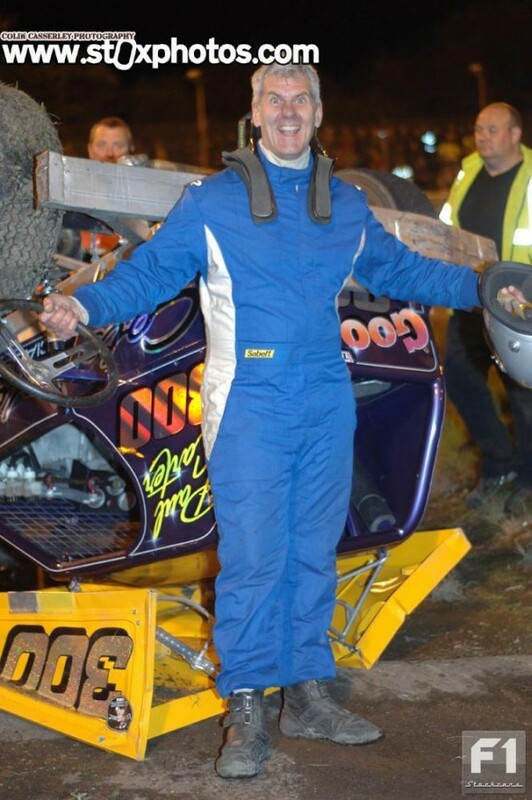 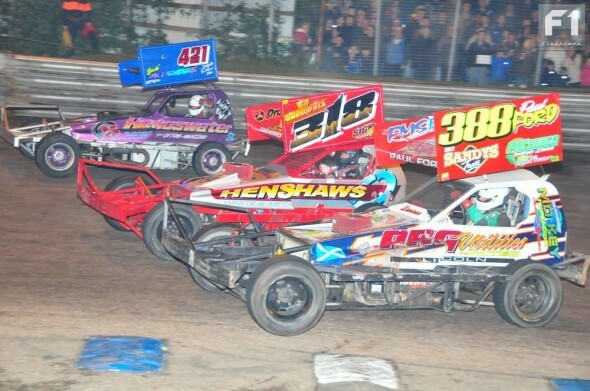 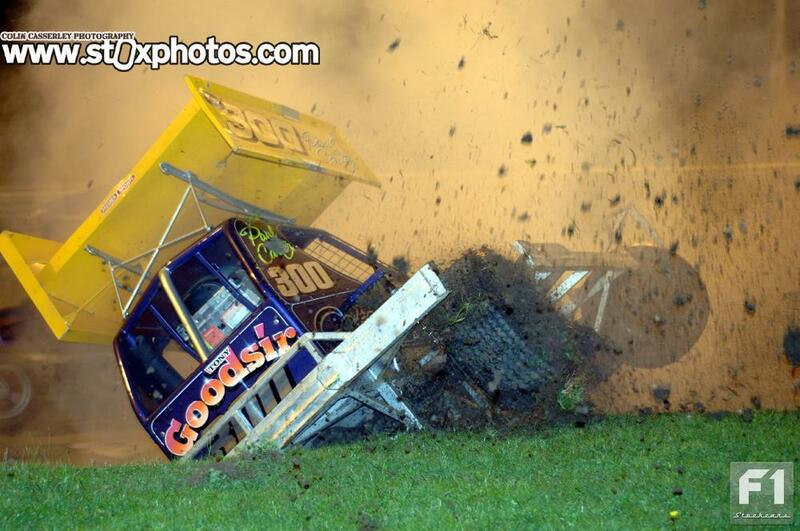 The Shoot Out boys really got stuck into each other with Mick Sworder the big loser as Wainman (515) moved clear. 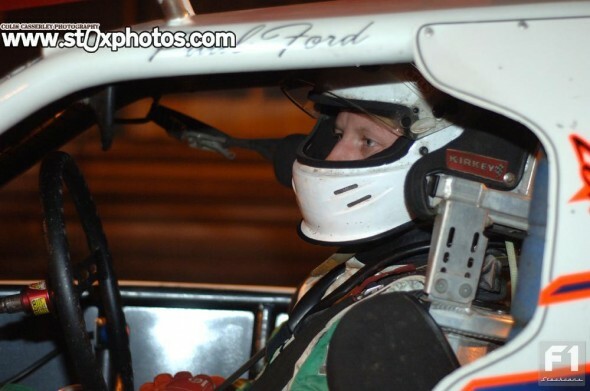 Bobby Griffin (166) took over the lead as Finnikin spun. Speak caught and launched Wainman wide, then set off in pursuit of the leader but Griffin was not to be denied his second victory of the night, with Wass following him home, just as in heat one. 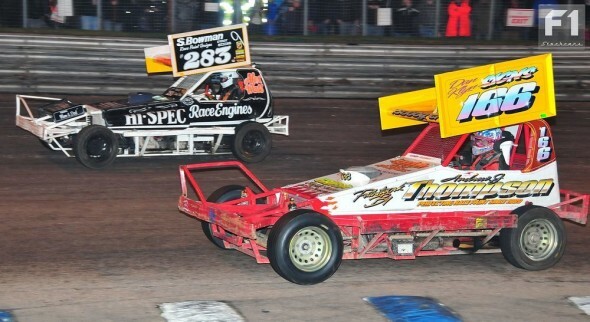 Speak’s fourth place hauled him to the top of the Shoot Out table on 245 points, 9 ahead of Newson on 236 with the Gold Top third on 229. Alex Wass (283) impressed again, leading for much of the Grand National until passed by Bobby Griffin (166).